CONSHOHOCKEN, Pa.--(BUSINESS WIRE)--IKEA, the world’s leading home furnishings retailer, today announced plans to install a fuel cell system manufactured by Bloom Energy at its location in Emeryville, CA – one of two San Francisco-area stores for the Swedish company. Consistent with the IKEA focus on emerging energy technologies, this project represents the first IKEA endeavor globally to convert biogas into electricity through a clean electro-chemical process. The fuel cell system will be installed, commissioned and activated by this summer, 2015. Slightly larger than the physical size of a commercial back-up generator, the 300-kW system will operate on biogas and produce approximately 2,497,651 kWh of electricity annually for the store, the equivalent of reducing 1,304 tons of carbon dioxide (CO2) – equal to the emissions of 249 cars or to providing electricity for 163 homes yearly (calculating clean energy equivalents at www.epa.gov/cleanenergy/energy-resources/calculator.html). Combined with the solar energy system installed atop the store in 2011, these fuel cells will help generate more than a majority of the store’s energy onsite. 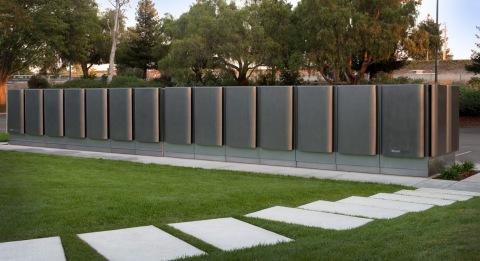 For the design, development and installation of this fuel cell system, IKEA contracted with Sunnyvale-based Bloom Energy a provider of breakthrough solid oxide fuel cell technology generating clean, highly-efficient on-site power. This investment in fuel cell technology reflects the company’s goal to be energy independent by 2020 and complements other IKEA renewable programs in the U.S., including solar presence at nearly 90% of its locations, a geothermal heating and cooling system at two stores, and two wind farms totaling 104 turbines. Drawing from its Swedish heritage and respect of nature, IKEA strives to minimize its operations’ carbon emissions because reducing its environmental impact makes good business sense. Globally, IKEA evaluates locations regularly for conservation opportunities, integrates innovative materials into product design, works to maintain sustainable resources, and flat-packs goods for efficient distribution. Specific U.S. sustainable efforts include: recycling waste material; incorporating energy-efficient HVAC and lighting systems, recycled construction materials, skylights in warehouse areas, and water-conserving restrooms. Operationally, IKEA eliminated plastic bags from the check-out process, phased-out the sale of incandescent bulbs, facilitates recycling of customers’ compact fluorescent bulbs, and by 2016 will sell only L.E.D. IKEA also has installed EV charging stations at 13 stores, with plans for more locations. Located on 15 acres at the confluence of I-80, I-580 and I-880, the 274,000-s.f. IKEA Emeryville opened in April 2000 and employs 300 coworkers. In addition to approximately 10,000 exclusively designed items, IKEA Emeryville presents 50 different room-settings, three model home interiors, a supervised children’s play area, and a 250-seat restaurant serving Swedish specialties such as meatballs with lingonberries and salmon plates, as well as American dishes. Other family-friendly features include a Children’s IKEA area in the Showroom, baby care rooms, play areas throughout the store, and preferred parking. Since its 1943 founding in Sweden, IKEA has offered home furnishings of good design and function at low prices so the majority of people can afford them. There are currently more than 360 IKEA stores in 47 countries, including 40 in the U.S. IKEA incorporates sustainability into day-to-day business and supports initiatives that benefit children and the environment. For more information see IKEA-USA.com, @IKEAUSA, @IKEAUSANews, or IKEAUSA on Facebook, Youtube, Instagram and Pinterest.